Na-Krul is the boss of the Hellfire Expansion for the first Diablo game, released in 1997 by Sierra and developed by their Synergistic Software Division. This Demon was once banished by Diablo himself and was unknowingly released by a sorcerer below Tristram. 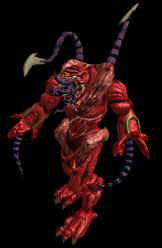 The player has to release him from a room and defeat him finally as part of the Hellfire Expansion Quests. Its basically the reason that this small gallery exists that Na-Krul was surprisingly claimed for the Game-Art-HQ Video Game Villains Art Challenge in December 2014 since this is one of the almost forgotten video game characters of the past.